Toronto Dogs Directory: 'Tis The Season.....Flea Season! 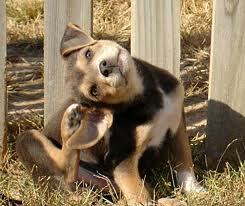 Fleas on dogs are not an uncommon ailment. If left untreated, an infestation can easily get out of hand. If you’ve discovered your dog has fleas, you can guarantee they will be found around the house. Female fleas begin laying eggs after only 48 hours of feeding, and can lay up to 500 eggs each! What a disaster! It is important to understand how fleas work and what to look for before starting a treatment. A veterinarian will also be able to help you with treatment options and recommendations for ridding your house of fleas. Dog fleas are known as Ctenocephalides canis. Fleas are a small, wingless insect that feeds off a host’s body to stay alive and reproduce. Any dog can contract fleas, not just a dog living in poor conditions. There are over 2,000 different species of fleas. Although they are most common in Europe, Asia and Africa, they are most definitely still a problem in North America. Fleas have excellent jumping skills and will jump from host to host. If you take your dog to the dog park often, he has a higher risk of contracting fleas from playing with other dogs. Dogs can also contract fleas from their environment, especially in humid climates. Other contributing factors may be a yard with lots of grass or bushes. Dogs are not born with fleas, but can be born with an allergy to fleas. Adult fleas are only about 5% of the population living on your dog. The rest is the eggs and larvae, which can be embedded under your carpet, bedding or household items. with a possible flea infestation. Itching/Biting – These are the most obvious symptoms. The most common areas to watch for are the head, above the tail, the paws and around the neck. Watch out for red, inflamed skin. Hot spots – Hot spots are wounds or sores inflicted from a dog’s biting and scratching. Hot spots are very unpleasant to deal with and may become very serious if not treated right away. Flea dirt – Flea dirt may be visible on your dog’s fur or skin. Flea dirty looks like little black specks, sometimes described as coffee grounds. Flea dirt is a combination of dried blood and flea debris. Use a comb to check your dog’s fur for flea dirt. If you’ve determined your dog has fleas, it is important to treat your dog right away. Along with treating your dog, the house and yard may need to be cleared as well. You can contact an exterminator for best results.